ESI Eurosilo is a Dutch solution provider of storage facilities for non-free flowing bulk solids and large quantities. Its highly automated silos offer maximum control in material handling, up to 100,000m3, while saving operational costs and valuable space. Its team of engineers and project managers are passionate about every touch point between bulk materials and storage solutions. What started with an innovative storage silo for a Dutch potato starch manufacturer in the late 1960s has now evolved into a range of powerful Eurosilo solutions for customers in major industries around the globe. ESI Eurosilo’s expertise has been recognized by operators, engineering contractors, consultancy agencies and material handling engineers throughout the power industry, chemistry and agriculture. A Eurosilo combines enclosed storage with a choice of ingenious reclaim mechanisms. These mechanisms are designed to enable reclamation of even such sticky bulk solids as FGD gypsum, making the notorious ‘flow-no flow’ criteria a thing of the past. This proven solution also meets the requirements of environmental protection agencies worldwide. Leading to over 40 years of experience, ESI Eurosilo has now built over 125 units around the world. Eurosilo has been very busy recently, and some of its projects are detailed below. ESI Eurosilo has recently unveiled its new website, which includes comprehensive information on the company’s capabilities, activities and contact details. It gives details of which products its silos can store, and the tried-and-tested ‘Eurosilo Concept’ is explained in full, with a video demonstration of the technology and a time-lapse video of the construction process of the world’s largest potato starch silo (see below for details). At the PKN ORLEN refinery in Plock Poland, the first real live filling process of the new 5,800m3 FGD Gypsum silo has been completed successfully. PKN ORLEN is a major oil refiner and petrol retailer, owning seven refineries and over 2,000 stations in Poland. After extensive system tests of equipment and operation software (cold commissioning), the desulphurization unit was fired up to produce the input for the silo.An extensive team, including ESI Eurosilo supervisors, overlooked the test with live input (hot commissioning). The main reason that PKN ORLEN is working with the Eurosilo concept is the very limited space at the plant site in Plock. Therefore the dewatering system was built on top of the silo, with load out directly underneath. Reliability and maximum uptime are essential, so ESI Eurosilo is really pleased with the satisfaction and confidence of PKN in the system and its efforts. To keep the capital expenses of its customers at a minimum, ESI Eurosilo is performing more and more mid-life conversions or retrofits of the silos that are being used. It is not possible to keep production facilities running for 20 to 30 years without regular check- ups and the timely execution of updates. Quite apart from technical considerations, a sudden change in regulations can suddenly outdate storage systems. So ESI Eurosilo is very used to its customers asking it to take a look at their facilities and come up with the best solution possible. A mid-life conversion is always a tailor-made project, which depends on circumstances and requirements. From 9–11 June this year, ESI was able to have its own conference at the Power-Gen Europe event in Amsterdam. ESI Eurosilo received its representatives from all parts of the world, from Asia to Europe and the US, to discuss current developments in their regions. The company was very pleased with the great presentation of the technical director of Trianel Lu¨nen Power regarding their goals and mission, and the experience with the Eurosilo coal silos. The Trianel powerplant had just received Peabody’s Clean Coal Award for achieving best emissions performance. ESI Eurosilo can look back on a successful meeting, completed by a boat trip and dinner at the EYE, the modern film museum of Amsterdam, and it looks forward to intensified contact and close co-operation on great projects around the world. The world’s largest potato starch silo is now being constructed for KMC at Karup in Denmark. KMC is a leading Danish producer of potato starch and potato flakes. ESI Eurosilo was awarded the assignment to design, produce and install the internal machinery. It designed a huge central shutter column of about 55 metres high to fit the maximum capacity of 88,500m3 of this huge silo. Production of the complete internal machinery is now under way. The projects execution is on a very tight schedule, as the silo has to be ready for operation this year. There is a very interesting time lapse video of the pouring of the concrete floor on ESI Eurosilo’s new website. 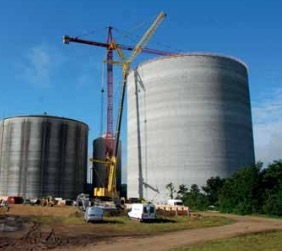 For more details on the project, please see ‘Returning to its roots: ESI Eurosilo builds the world’s largest potato starch silo’ on p110 of the September 2015 issue of Dry Cargo International. Besides the largest potato starch silo, ESI Eurosilo is also involved in other projects in Slovenia and Poland.